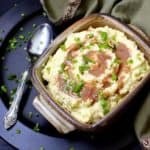 Here's a recipe for easy and rather addictive Creamy Vegan Mashed Potatoes. The spuds are mashed, then whipped until they are fluffy and soft as clouds. They taste rich and decadent, exactly as the best mashed potatoes should. Vegan, soy-free and gluten-free. Place the raw cashews in a high-powered blender with 3/4 cup of water and blitz until very smooth. Place the potatoes in a microwave-safe bowl and cover with water. Cover with a microwave-safe lid or dish and zap 10-15 minutes on high or until a knife inserted in the center of a potato goes cleanly through. Since different microwaves work differently, I'd recommend starting out with 10 minutes and adding more time if needed. When the potatoes are cooked, take the bowl out of the microwave, being very careful not to burn yourself by spilling the hot water, and drain the potatoes. When cool enough to handle, peel and mash with a potato masher. Add the melted butter, salt and ground black pepper to taste, and half the cashew cream. Mix well, then, using a handheld mixer, whip the potatoes for about two minutes, stopping frequently to mix with a spatula. If doing this in a stand mixer, use the whisk attachment. Add more of the cashew cream as you mix, until you get the consistency you like. Check seasoning and add more salt and ground black pepper if needed. Scrape into a bowl and season with chives or parsley.